Solid, dependable performance that’s perfect for family camping and for moderately demanding outings. Portable, spacious and easy to pitch — Onyx is an affordable Nordic tipi that’s a truly reliable friend. The onyx stone is believed to give its bearer protection and help to see things in a wider perspective. 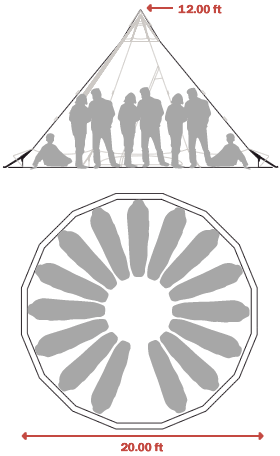 No doubt our Nordic tipi with the same name will offer its user protection when seeing the world. The Onyx gives you performance with economy. You get all the good qualities of a Nordic tipi such as a lot of space, good ventilation and the comfort of an open fire inside the tent — but at a much lower price than the Safir, our most advanced Adventure model. 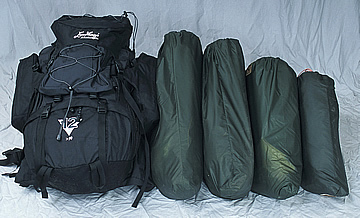 The Onyx series is a reliable and well-equipped tent that’s affordable. You can carry Onyx easily in your backpack and it can seat up to 27 on the floor, around an open fire if you desire. Photo shows packed view of light model tents in all sizes from largest to smallest. (Backpack for scale). 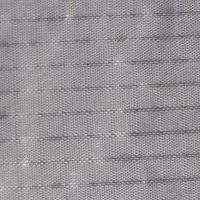 Lightweight nylon 66 fabric, PU-coated on one side. Carefully selected to be waterproof after prolonged use. Grey color blends well in nature. The Onyx is our entry-level tent design for economical camping. 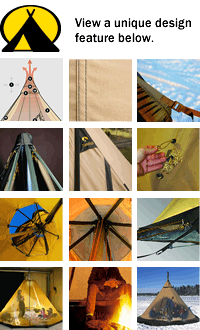 The fabric has no reinforced edging at the bottom of the tent, as found in the Zirkon and Safir range. This Nordic tipi has no special fresh air intakes at the bottom like Zirkon and Safir, but has a mosquito-protected door which can be used as an air intake plus simplified indoor ventilation regulation. Despite its simpler design and materials, Onyx remains an excellent Nordic tipi with high scores for safety and performance in heat, rain, snow and cold. As with all our Adventure range, you’ll have loads of space and full standing room, plus that rare luxury — a companionable open fire if you desire. Click the button below to add the Onyx 15 - Light Tent to your wish list.